This project has been on the go for a while, which is exactly how I like it. I really enjoy having a little something to work on in the evenings or while on holiday. I dyed the fabric, a white 100% cotton knit, with indigo last year at the studio of Trudi Pollard. In my enthusiasm, I forgot to pre-soak the fabric in water and added it dry to the dye pot. This is not recommended as it introduces air into the vat. 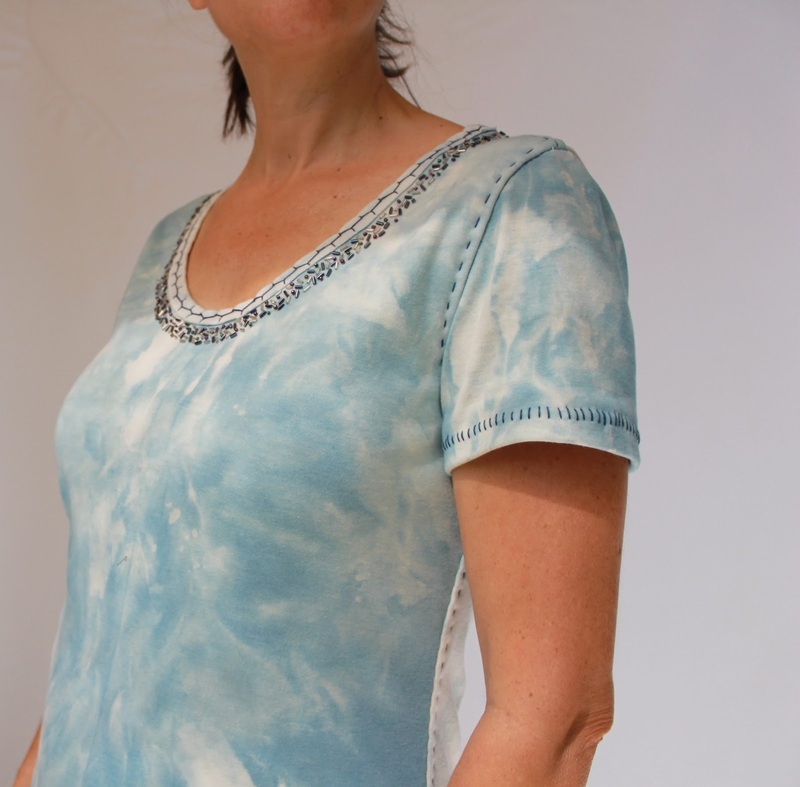 However, it did produce this lovely splotchy blue and white pattern as the dye penetrated the scrunched up fabric. I just love that faded denim colour. I used the StyleArc Tammy dress pattern as it's one of my favourite patterns. 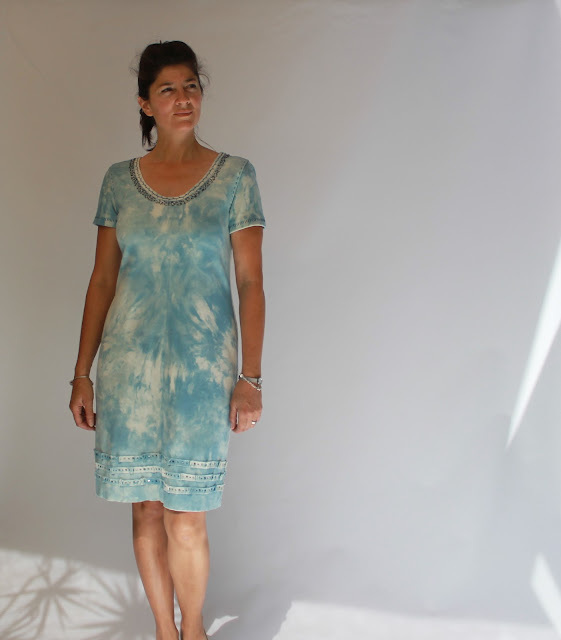 I used two layers of fabric in the dress, the blue on the outside and the same fabric in plain white on the inside. They were treated as one piece and handsewn together to create the dress. This gives the dress more structure. I used navy blue embroidery thread for the topstitching. 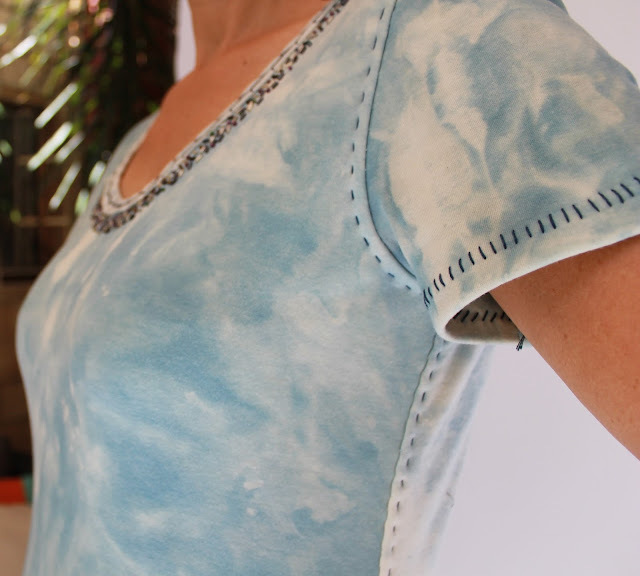 The neckline is finished with a strip of fabric folded over the raw edge and stitched in place with a decorative stretch handstitch. I have taken to basting the neckband on by machine before the hand sewing as I find it easier to stretch the band while machine sewing it. It's quite hard to stretch the band enough while hand sewing. This way the band sits nicely and doesn't flip out. I removed the machine basting afterwards. 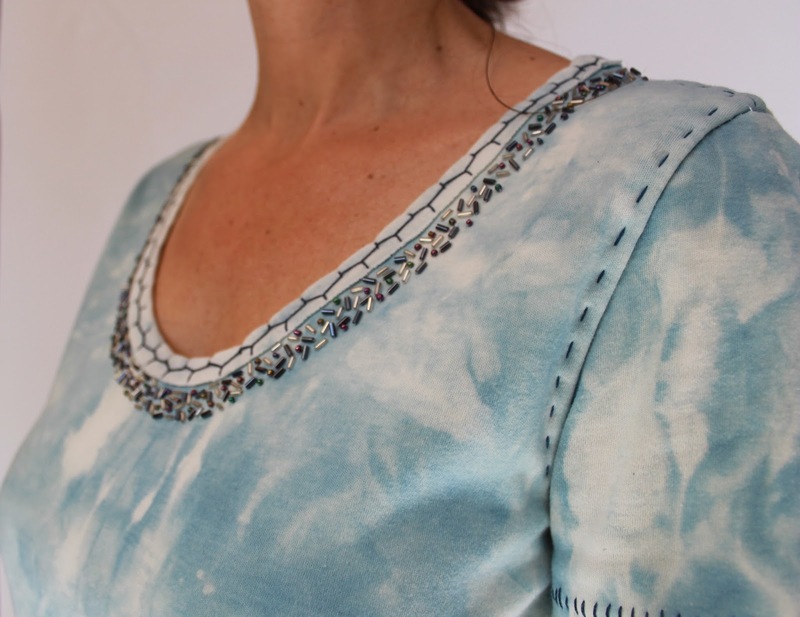 The neckline is also embellished with tiny blue and white beads sewn in a random pattern. I had to hunt down my tiniest needle to fit through the beads. The beads are sewn all the way around the neckline, none of that RTW only-on-the-front nonsense! The sleeves were finished by turning under and hand stitching in place. 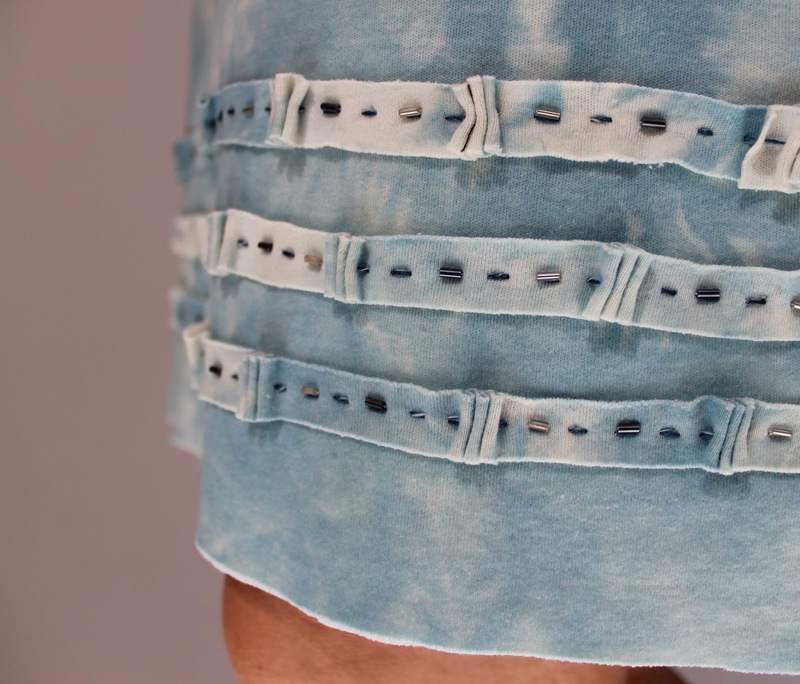 The hemline edge was left raw and I stitched three narrow strips of fabric above the hem with little pleats here and there and a few beads to catch the light. This ruffled technique is one I've long admired from Natalie Chanin's books. I was rather sad when this project came to an end. I kept thinking of new embellishments I could add, but decided that there was enough going on as it was. This was very quick for an Alabama Chanin project as there was no applique. 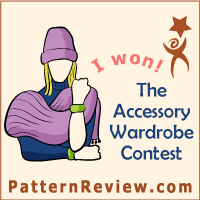 I have done a reverse applique project before but I think this plainer design probably suits my lifestyle better. It doesn't stop me drooling over Alabama Chanin applique though, most notably Carolyn's beautiful outfit she posted a few days ago, which is probably the best I've seen anywhere. Lovely dress! I like the handwork details, especially the beading. Wow! But wow! I love the beading, and you could not get that random dyed effect if you tried. I want one. It's just as well I forgot to soak the fabric as I wouldn't have dared break the rules of the vat! Love your dress! Did you lower the front neckline? I think you stopped embellishments just at the right moment. 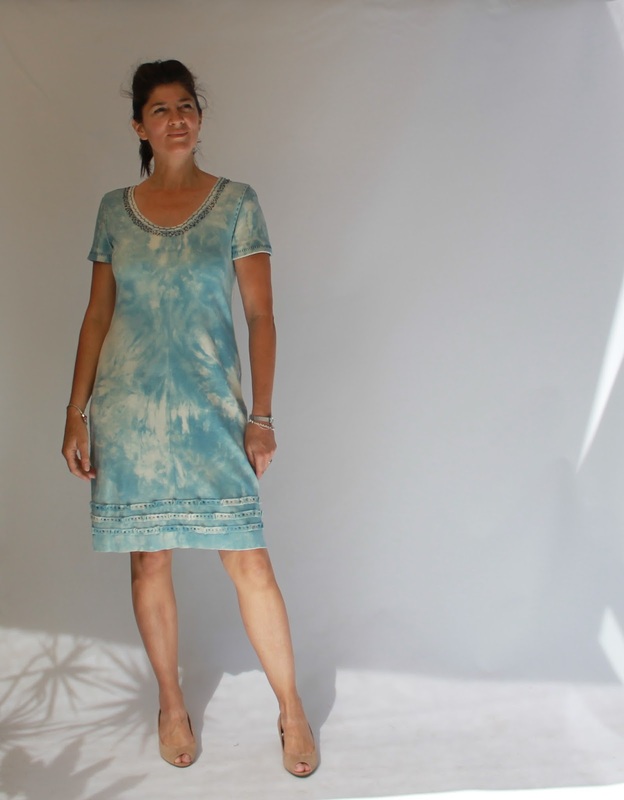 This dress is perfect – I wouldn't add nor eliminate anything. Wonderful in all aspects! That splotchy dyed effect was a very happy accident. I love this dress...it has the perfect amount of embellishment and the pattern you chose was ideal for this design. Beautiful work! Love everything about it--the color the beads--all of it!! Thank you. It does feel very special to wear! The dress is just lovely. I adore the embellishment, its exquisite, and so beautifully balanced. Thanks for the tip re machine basting the neck. I've hand sewn a neck binding or two and found the stretch factor very difficult to manage, so I'll be using your idea next time. Wow, this is a gorgeous dress. And you did a fantastic job. I love the colors you achieved accidentally. Like it was meant to be! Thanks for sharing. Sometimes the best things happen by accident. 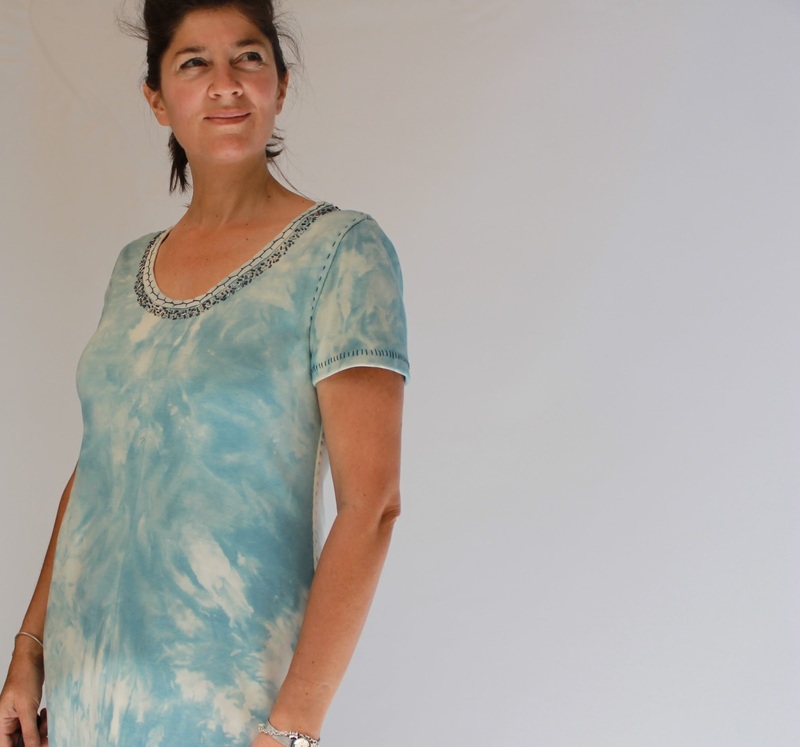 Your dye effect is beautiful as is the whole dress. Lovely. I really like your dye effect. Beautiful beading! You mentioned using your tiniest needle - I've been having trouble using the Milliner needles Alabama Chanin sells for beading -- they fit through the beads OK, but they are so hard to thread with the button craft thread they recommend (even one strand). What thread did you use with your tiny needles? Thank you. Yes, I used a tiny needle threaded with normal sewing thread and sewed as a double strand. I haven't had any trouble with the beads coming loose. Thanks so much for your reply! I will try that.